Kick up the heat with an invitation that moves to the beat ! 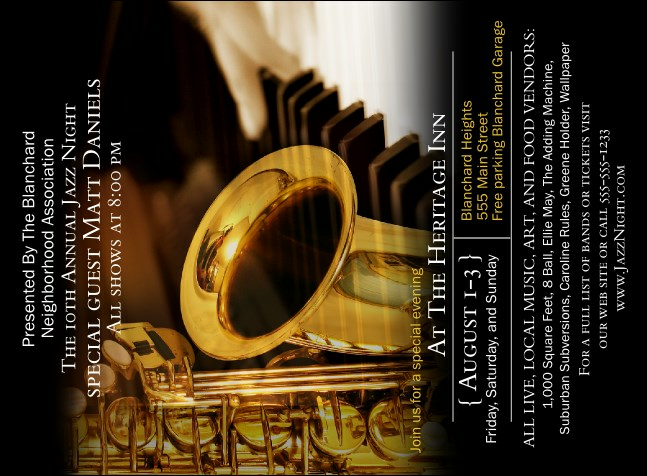 When the rhythms are cool, your sales will be hot with this swanky Jazz Invitation featuring a saxophone and keyboard. Let TicketPrinting.com take the stress out of your next event with these inexpensive and fully customizable Jazz invitation templates! Be sure to check out the matching promotional materials in this Jazz themed Event Kit. With a cohesive Event Kit from TicketPrinting.com, your next event will top the charts!